Stereotactic body radiation therapy (SBRT) treatment has been proven safe for patients with breast, non-small cell lung cancer (NSCLC), and prostate cancer who have developed three to four metastases, or two metastases in anatomically close proximity, according to phase I clinical trial results presented at the ASTRO 2018 annual meeting held in San Antonio Oct. 21-24. This exciting news may help guide clinical practice and support off-protocol use of SBRT treatment as an addition to standard systemic protocol. SBRT delivers fewer, tightly focused, high doses of radiation therapy while minimizing radiation exposure of surrounding normal tissue. The clinical trial (NRG-BR001) sponsored by NRG Oncology was undertaken to determine a recommended SBRT dose for each metastatic location being treated and to establish the safety of SBRT dose schedules commonly used to treat a single metastasis in patients with multiple metastases. 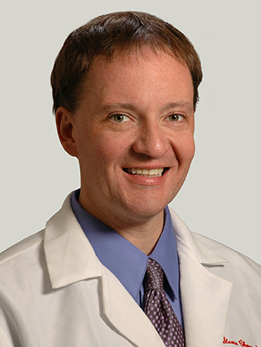 Principal investigator Steven J. Chmura, MD, PhD, (pictured above) of the University of Chicago, said that little prospective evidence of the safety of using SBRT to treat multiple metastases previously existed. Thirty-six patients were evaluated to determine the best SBRT for metastases in seven different metastatic locations, and to study acute and long-term toxicities to determine their level of acceptability. The patients had either recurrent breast, NSCLC, or prostate cancer or stage IV disease. Twenty-one patients had three distinct metastases, 12 patients two, and two patients four. They received 3 to 5 fractions of image-guided SBRT to all existing metastases over 1-3 weeks, with at least 40 hours between treatments for an individual metastasis. Each metastasis was assigned to an anatomic location, with a minimum of six patients having a metastasis in that location. The locations included peripheral lung, central lung, mediastinal/cervical lymph node, liver, spinal/paraspinal, osseous, and abdominal-pelvic. Dose-limiting toxicities were cohort-specific, and initial starting doses were based on expert consensus. Dr. Chmura stated SBRT planning was flexible, with participating institutions and physicians able to prioritize whether SBRT treatment should cover the entire planning target volume (PTV) or a portion of it. Sixteen patients experienced 48 grade 3 or higher adverse events (AE) regardless of their relationship to the SBRT treatment. Eight patients experienced 17 AEs that were a result of treatment by their physicians. However, the study team reviewing outcomes reported that 10 of these treatment-attributed adverse events experienced by four patients were not mechanistically related to treatment. He also told ASTRO attendees that treatment of patients with multiple metastases has been expanded into nine randomized clinical trials, including seven SBRT/immune combination trials currently accruing. One such trial is NRG-BR002, a randomized phase IIR/III trial of standard of care therapy with or without SBRT and/or surgical ablation for newly oligometastatic breast cancer. One hundred thirty-six locations are participating, with the goal of enrolling 402 women and men. Patients will either receive planned systemic therapy or planned systemic therapy and SBRT in 1, 3 or 5 fractions within three weeks. This experimental group may also have surgery in addition to systemic therapy and SBRT. This clinical trial began in December 2014. Its primary objectives are to determine whether ablation through SBRT and/or surgical resection in oligometastatic breast cancer patients improves progression-free and/or overall survival. Secondary objectives include analysis of the appearances of new metastases for each study arm and the incidence and severity of adverse events. The LU-002 randomized phase II/III clinical trial will evaluate the impact of adding SBRT to maintenance chemotherapy in treating patients with stage IV NSCLC. Three hundred patients are being recruited at 152 study locations to either receive chemotherapy alone or SBRT to up to three discrete metastatic sites, and irradiation of the primary site with SBRT or hypfractionated radiation therapy followed by maintenance chemotherapy. Progression-free survival and overall survival will be assessed as the primary objectives. Secondary objectives will include a comparison of quality of life, impact on toxicities, primary and in-field local failure, and out-of-field disease progression. ASTRO '18 SBRT reported safe to treat multiple metastases. Appl Rad Oncol.